Norman E. Borlaug accepted the Congressional Gold Medal in July 2007. The cause was complications from cancer, said Kathleen Phillips, a spokeswoman for Texas A&M University, where Dr. Borlaug had served on the faculty since 1984. 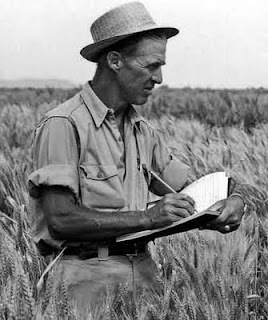 Dr. Borlaug’s advances in plant breeding led to spectacular success in increasing food production in Latin America and Asia and brought him international acclaim. In 1970, he was awarded the Nobel Peace Prize. He was widely described as the father of the broad agricultural movement called the Green Revolution, though decidedly reluctant to accept the title. “A miserable term,” he said, characteristically shrugging off any air of self-importance. Yet his work had a far-reaching impact on the lives of millions of people in developing countries. His breeding of high-yielding crop varieties helped to avert mass famines that were widely predicted in the 1960s, altering the course of history. Largely because of his work, countries that had been food deficient, like Mexico and India, became self-sufficient in producing cereal grains. His insistence on breeding in two places, the Sonoran desert in winter and the central highlands in summer, imposed heavy burdens on him and his team, but it cut the time to accomplish his work in half. By luck, the strategy also produced wheat varieties that were insensitive to day length and thus capable of growing in many locales, a trait that would later prove of vital significance. The Rockefeller team gradually won the agreement of Mexican farmers to adopt the new varieties, and wheat output in that country began a remarkable climb. But these developments turned out to be a mere prelude to Dr. Borlaug’s main achievements. He remained a vigorous man into his 90s, serving for many years on the faculty of Texas A&M and continuing to do vital agricultural work. In recent years, he marshaled efforts to tackle a new variety of rust that is threatening the world’s wheat crop. By Mr. Toenniessen’s calculation, about half the world’s population goes to bed every night after consuming grain descended from one of the high-yield varieties developed by Dr. Borlaug and his colleagues of the Green Revolution.